BLAIRS Commercial Sump Pumps are especially configured for managing the dirty water for pumping liquids which has suspended solids such as short fibers and sewage. Due to this, these pumps are widely used in domestic and civil applications. These sump pumps are ideal for transferring the mix of Water+Mud in areas such as residences, industrial applications, business waste applications and underground car parking. BLAIRS Commercial Sump Pumps are installed in a built pit where we recommend the dimensions to be 500x500x500 mm. This is for the fixed installation for giving a complete drainage, hence ensuring precise operation of the automatic float switch. 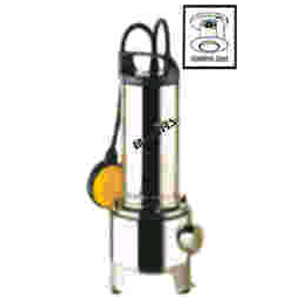 The Commercial Sump Pumps are built with stainless steel parts and carbon bearings. These feature single-stage, completely encased, fan cooled electric engine, and are outfitted with a buoy gathering for programmed shutoff. It can exchange material extending from 40 to 200 degrees F (4 to 93 degrees C), and requires a sump pit no less than 14" in width and 24". except the float assembly, the entire structure and parts are shipped on order. Mechanical action is implemented in the movement of fluids, gases, or slurries.